This episode of Money Never Sleeps Radio hosted by Louis Velazquez touches on Twitter, Blockchain Technology and much more. It’s been a roller coaster ride in the markets as of late from the run up in 2017 to the continued run up in 2018 with a slight correction in motion and its healthy. Nothing goes up in a straight line for a long period of time, there has to be breathing room allowed for it to settle back and forge forward. This doesn’t just hold true for the market as a whole but for individual stocks as well. If you follow me on Twitter then you would know that while everyone or most everyone on the street was bashing Twitter and basically calling in the fat lady to sing, I’ve been saying don’t sleep on this company. The reality is this, Twitter has true value, it pioneered mass public sms, pure and simple. Its reach is larger than most think and its potential hasn’t even been fully tapped but I believe it will be soon enough. The stock has doubled from its lowest point in May 2017, so not even a full 12 months yet. Honestly this is just the beginning of the ride and for those that understand what the value of the company’s products to the future of communication, well they will benefit tremendously. For traders, it’s been a trading heaven and continues to be with call volume increasing and becoming more pricey and put action slowing down a bit for the moment. So lots of opportunity for short and long term gains in my opinion. For full disclosure, I do not personally own Twitter but my trust has a long term position in the company. I love innovation and technology, without technology you can’t really innovate so it goes hand in hand. I feel that artificial intelligence, virtual reality, gaming, smart technologies and blockchain technology will be a wave that will last for decades. There is no question that new homes and buildings will incorporate not only smart technologies but also artificial intelligence and in some cases blockchain technology. With smart cities being pushed further globally, new building initiatives are demanding for smart technology, from the affordable level to the high end level and commercial. 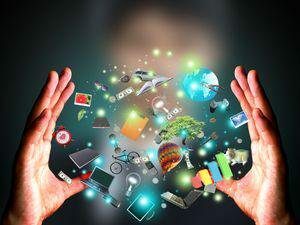 You will see the growth in this area and the innovation will just bring the connectivity for smart cities greater and greater. If you ever questioned if gaming was a big market, well it’s a huge market and all the ancillary businesses with virtual products have grown into the billions. Just look at Nvidia, they are posting records gains and producing products that will serve the high capacity gaming arena, its just the beginning. Blockchain technology, you hear this all over the place now, iced tea and clothing companies are changing their names to incorporate blockchain in its name solely to capitalize on the trend. It’s a big joke in my opinion, how do you transition your company from selling a product and in a day shaazzaamm you’re a technology company, crazy. And talking about crazy, I’m going to be talking more and more about cryptocurrency and blockchain technology, for a number of reasons. First I love technology, second blockchain technology and cryptocurrency are here to stay and thirdly I would like to give my spin on cryptocurrency itself and shed some light on the nonsense with ICO’s. Everywhere you turn there is some Initial Coin Offering “ICO” being launched, they don’t have a coin just an idea and they are raising capital for that. Well where I come from if you are raising capital to grow a business you’re either doing a private placement or an initial public offering. You can do an exempt private placement but still comply with the securities & exchange rules in place currently but ICO’s are a different breed, they should be regulated not just randomly show up, raise $20 million and then get to work. This opens the door to lots of fraud and investors should beware of this, even though you have hedge funds and other financial institutions promoting some of these ICO’s don’t get rooked into the hype. In the world of cryptocurrency there needs to be an underlying value to it otherwise its potentially worthless. Bitcoin undoubtedly is the grandmother of them all, when it was created it was for a purpose but I am pretty sure that purpose has been warped at this point. The value of Bitcoin is its distribution and peer to peer acceptance, plus the exchanges are now carrying futures contracts on it. That legitimized Bitcoin and all cryptocurrency so now you have to pull the veil off and see what the true underlying value of an issue is. Without the peer to peer then any cryptocurrency issued with no real value to it will eventually fall off. Bitcoin and maybe Bitcoin Cash will survive , but more so Bitcoin because of its legacy value but that’s about it. Ethereum has a platform that allows others to create their own blockchains on their network as well as coins etc. This is of value because there is an underlying business model of sorts behind it. As more users create more blockchains and issue more cryptocurrency and tokens on their network then it will just continue to grow, so I like what they are doing. Ripple has a platform that is specific for the banking world, they struck a deal with Moneygram to use their technology to move money globally while cutting costs. This is of value, it’s a company with tons of growth potential and a sound foundation. So I like what they are doing as well. Pecu Novus has a platform that is partially asset backed and allows for coins to be used to invest in companies, used for import and export, real estate transactions, vehicle purchases, supply purchases and the list goes on. They feature an escrow system that allows coins to be set in escrow until the transaction is completed. I like it because it serves a purpose and is partially asset backed so that makes me comfortable. I’m advocating for this one in a big way. I’ll be talking a lot about these three cryptos over the next few months as more innovation comes about. For investors just be diligent, focus on the value and not the hype. Forget about the online ads and hype emails, look for the value if you are going to play in this space. I will leave off with this, when regulation comes down and it will, the issues that are prepared for it will survive while the other 99% will fall off. Ok that its for this episode of Money Never Sleeps, remember to follow me on Twitter to hear my random thoughts and spread the word about the show. We are ramping it up now and we want to bring forward value to our listeners. So with that said, be safe out there with the bad weather and have an awesome trading day.